As someone who has been tracking the childfree choice since the late 1990s, when new books on this topic come out I read them with great interest. 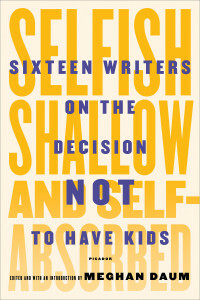 One of the latest is writer Meghan Daum’s Selfish, Shallow and Self-Absorbed: Sixteen Writers on the Decision NOT to have Kids. Meghan sent me an advance copy of this book of essays by 16 writers about how they came to this decision in their lives. Her introduction is smart. She suspects the “majority of people who have kids are driven by any of just a handful of reasons, most of them connected to old-fashioned biological imperative.” Indeed. The AKA here is pronatalism, and how our social and cultural conditioning drives the creation of desire for parenthood in our society. Still others like Geoff Dyer stumble “onto or into” the hearts of the matter. He gets into his truths of desire – specifically, his lack of desire for the parenthood experience. He writes how he has yet to hear a convincing argument why he should spend hours and years doing something he just does not want to do. The paths are varied indeed. But one thing sticks out- that ending up with no kids, whether by circumstance, ambivalence, or life taking a certain course, ultimately other things were more important to these writers than the parenthood experience. 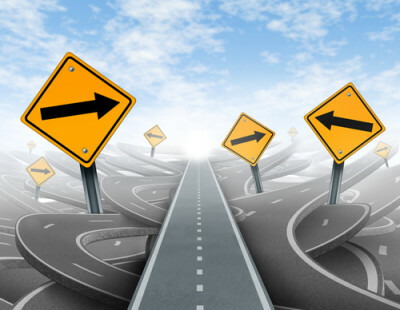 Understanding what was more important will make you “get” these nonparent writers. These honest and diverse essays add to other collections of essays written by those who have chosen to follow their own paths, and go against the grain of a pronatalist society. 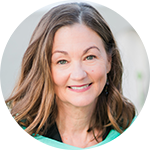 Daum’s collection joins Henriette Mantel’s No Kidding: Women Writers on Bypassing Parenthood and Aralyn Hughes’ Kid Me Not, which includes essays from women (she knows) from the 60s who are now in their 60s. Beyond writers and boomers, the truth is, so many different kinds of people have their story about deciding to have no children. They are your servers in restaurants, your child care workers, your grocers, your teachers, your accountants, and the list goes on. They are from all walks in life – all occupations and lifestyles. May the next book in this nonparent essay genre expand the conversation to the larger reality – and present ever so clearly that we may remain in the minority – but we are everywhere. Those who have landed on nonparenthood will understand how each person in this book landed at their choice in their own way. Daum’s book will help those in the midst of ambivalence to drill deeper into their own story. Parents and would-be parents who read this book will better understand how each person has their own road to making one of the most important decision of their lives. I’d like to eventually get around to reading this book. I’ve also been able to read two chapters of the Baby Matrix, which I really liked. I don’t know whether I’ll have a kid or not (no one really does I guess), but this gives me ammunition for whenever some patronizing jackass who says a CFer will change their mind about parenthood. That really bugs me, this is an irreversible, extremely profound decision and strangers just lightly tell people “you’ll change your mind” almost to bring themselves satisfaction that everyone will do this one thing. It drives me mad. I can say, from what little I’ve read from your book, that I have less anxiety about the subject. If I choose to be CF, I think I’d be more confident in my decision, and less self-conscious about it. Hi remaininlight-Thanks for writing~Meghan is a lovely essay writer in her own right, and has done a nice job at putting together a collection that shows the many, many ways people arrive at the choice to say no to parenthood. The “change your mind” messaging stems from the pronatalist belief that we are all supposed to want to have children. The reality is, as you may have read in The Baby Matrix already, that there is no real evidence to support the notion that we are biologically wired for the desire to want children. Understanding pronatalism and its generations of influence help us understand and see through truths and myths behind powerful social and social cultural conditioning around such an important decision in our lives!